While we are all debating the merits of grains, whole and not (my bottom line: they are too delicious to give up; like everything else, eat in moderation), how about this version of the USDA’s Pyramid, courtesy of Eminem? Happy new year! I agree that the labeling is confusing but the dietary advice is pretty clear and well backed by research: whole grains are good to eat. Whole grain means just what it says–the entire seed of wheat, rice, or whatever. Whole grains contain all of the nutrients–vitamins, minerals, fiber, antioxidants–in the seed. Processing removes much of these, leaving just the calories and starch. So you want to look for 100% whole grain. I’m not aware of any controversy over the benefits of whole grains; the evidence for their nutritional benefits is quite strong. The arguments are about processed grains that have much of their nutritional value removed. Does that help? The USDA has just published a report on eating whole grains. Who eats them? Hardly anyone, apparently–just 7% of the people surveyed meet recommendations. This 7% is the population segment that reads food labels, buys organic, and eats healthfully anyway. The USDA wrote this to establish a baseline. Stay tuned for the interventions. What should they be? Question: Does the term “whole grain” mean the same as “100 percent whole grain”? If a product is labeled as “whole wheat bagel” or “whole wheat pizza,” how much whole wheat should it contain? Answer: FDA has not defined any claims concerning the grain content of foods…We recommend that products labeled with “100 percent whole grain” not contain grain ingredients other than those the agency considers to be whole grains….We note that wheat flour should not be labeled as a whole grain flour because wheat flour is a synonym of flour…However, whole wheat flour (§ 137.200) should be considered a whole grain flour because it contains all the parts of the grain, i.e., the bran, endosperm, and germ…. Translation: The Whole Grains Council is doing a bit of an end run around the FDA. Is this a public service? You decide. 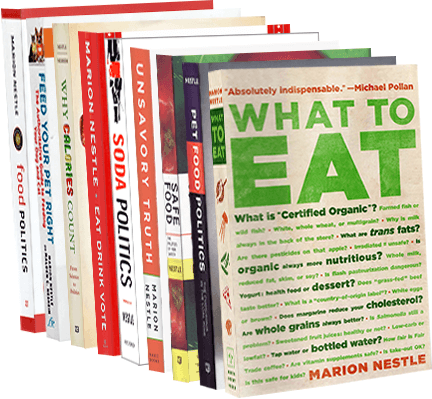 Check out the Bread chapter in What to Eat and enjoy whole grains!